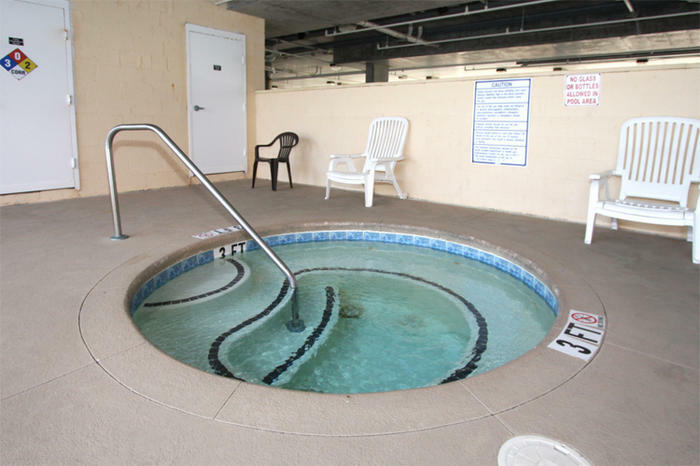 Indulge in the finest accommodations that the North Myrtle Beach area has to offer. This intimate setting of North Myrtle Beach condominium rentals is across the street from the beach. Located in what is known as the Cherry Grove section of North Myrtle Beach, SC this ocean view resort is near the Cherry Grove Fishing Pier, a popular North Myrtle Beach attraction. Featuring a limited number of North Myrtle Beach vacation rental units, Most of the North Myrtle Beach condominiums at Cherry Grove Villas are two stories with multiple balconies. The North Myrtle Beach condo rentals that are located on either end of this North Myrtle Beach resort are each on one level and feature more windows and therefore more sunshine than the interior North Myrtle Beach condominiums. The end units at Cherry Grove Villas are all four-bedroom, three-bath North Myrtle Beach condominium rentals. Each North Myrtle Beach vacation rental differs in furnishings, so the number of people accommodated in each unit is different. Typically, the four-bedroom condos in this North Myrtle Beach resort sleep between 10 and 15 people. Cherry Grove Villas’ interior North Myrtle Beach vacation rentals feature two stories of living space and five or six private bedrooms. All of these North Myrtle Beach rentals on the interior of Cherry Grove Villas have five bedrooms and accommodate from 14 to 20 people. These North Myrtle Beach condominiums are wonderful for larger families, multiple families and golf foursomes. There is plenty of privacy and elbow room in these North Myrtle Beach rentals. Each of these condos in North Myrtle Beach, SC has a beautifully furnished kitchen with full-size appliances that include a convenient dishwasher. A microwave and coffee pot are pretty standard at Cherry Grove Villas. A washing machine and clothes dryer are provided for you in each of the vacation rentals at this North Myrtle Beach resort. At least one DVD player is found in your North Myrtle Beach vacation rental. The ocean view balcony is a dreamy place to relax. The fresh air is welcoming and the promise of the beaches being right across the street help make the second-row views even more delightful. The spacious accommodations will make your whole family smile. Cherry Grove Villas will make your day with all of the amenities that each North Myrtle Beach vacation rental features. Elliott Beach Rentals is not affiliated with onsite management or the HOA of Cherry Grove Villas.